Use your slow cooker to braise these short ribs to perfection! 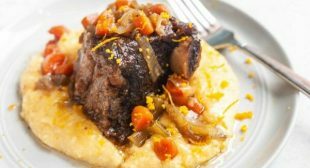 They become incredibly tender in mix of beef stock and bourbon, and are terrific served on top of cheesy grits. It’s a dish that warms you from the inside out.